Storm drops fresh snow making roads slippery as colder weather approaches. WATERVILLE — The light snow that fell across most of the area on Sunday is expected to make way for colder temperatures later in the week, according to the National Weather Service. The small storm, an after effect of the snow that hit southern Maine on Saturday, produced minimal accumulation in Central Maine although it was enough to create slippery driving conditions, the worst of which were reported on Interstate 95. Twenty-five crashes were reported on the interstate Sunday morning along the roughly 50-mile stretch of highway from Augusta to Newport, said Trooper Rick Moody of the Maine State Police. The first accident was reported around 9 a.m. and troopers remained busy until about 2 p.m. he said. In Waterville, a green mini-van driven by a woman who was not wearing a seatbelt and was talking on the phone rolled over near Exit 127 of the turnpike, said Moody. 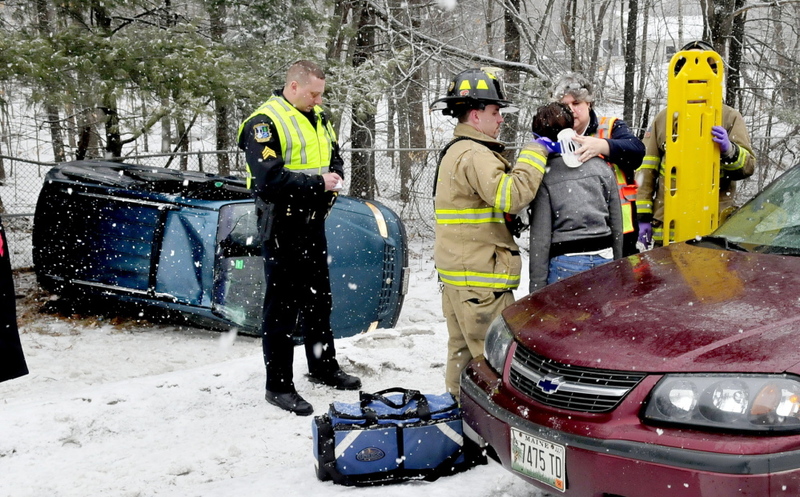 The driver, Elizabeth Peavey, 28, was uninjured, but the accident did cause two other cars to skid off the road, he said. Elsewhere in the city a hit-and-run accident involving two vehicles near the intersection of Cool Street and Kennedy Memorial Drive also drew a response from local police. The cause of the accident is under investigation, but it appears to have been related to the weather, said Sgt. Lincoln Ryder of the Waterville Police Department. “The more snow we get the worse the roads get. Public works crews were good about getting the roads sanded and salted, and although that was effective initially, it looks like they will be out again today,” said Lincoln on Sunday. Five motorists on the interstate were also charged with improper passing of an emergency vehicle for failing to slow down and move over while passing the scene of an accident, said Moody. The charge, which comes with a $311 fine, is part of a state police effort to crack down on drivers who do not adhere to laws designed to protect police and emergency response personnel as they are doing their jobs, he said. For most of the day, speed limits on the Maine Turnpike section of Interstate 95 from Kittery to Augusta were reduced to 45 mph. By mid-afternoon weather conditions had improved, but drivers were still advised to be cautious. Over the weekend the storm dumped up to seven inches of snow in some parts of southern Maine, although snow accumulation was minimal in the central and northern parts of the state. By 12:30 p.m. Sunday, parts of Knox County had received four inches and about 1.5 inches had fallen in Waldo County, according to a report from the weather service. There were no snowfall totals for Kennebec, Franklin or Somerset counties. In Somerset County, the roads were snowy and slippery, said Kelly McQuarrie, a Somerset County dispatch officer. She said there had been multiple accidents related to the weather, most of which took place on Interstate 95. The snow will be followed by a cold front that will set in on Tuesday morning, said James Brown, a meteorologist for the National Weather Service in Gray. Following highs in the 20s on Monday, temperatures are expected to drop to below zero almost every night this week, he said.